Take your Vtiger CRM wherever you go. Pocket CRM for Vtiger turns your mobile phone as Vtiger CRM. Get instant access to your Vtiger CRM for any mobile devices. Easy to view, add, edit & delete any CRM information. Manage your business process on the go. Simplest, fastest and secure way to access your Vtiger CRM data from anywhere. Easy to access, add, edit or delete any Vtiger CRM data from any iOS, iPad, Android phones, and Tablets. Pocket CRM for Vtiger changes the way you work. Get all your Vtiger CRM updates on the fly and close more deals. Allow your sales & marketing team to carry your customer data, deal info and more wherever they move. More intuitive and detached design for your Mobile phones, Tablets, and iPads that makes it more convenient to use. Log in once and access the complete Vtiger CRM information from anywhere and in any time. Remove all your unwanted CRM data in just a single Swipe like any other deletion. Managing your CRM records while you’re on the go, is never been easier. But with Pocket CRM for Vtiger you can easily get to know the complete list of all your CRM info on the fly. Now accessing, analyzing and updating the CRM data is much faster and easier than ever. Done with your client meeting? Don’t wait to get back to your desk, just open your mobile app & make changes in your CRM. 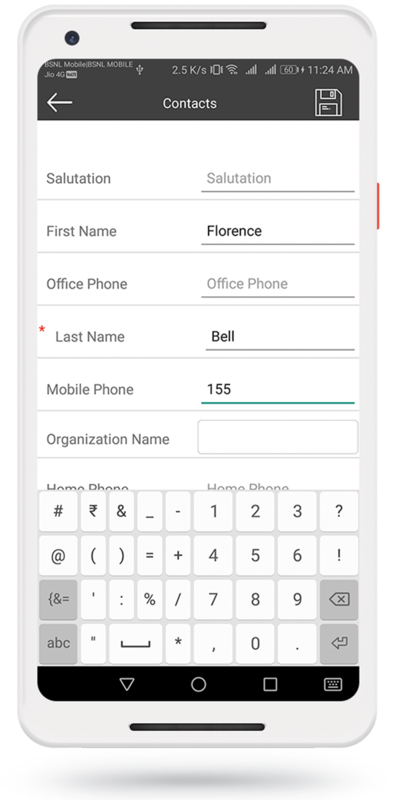 You can easily add and edit any CRM information right away from your mobile. No matter wherever you are, instantly access any of your default CRM module information.